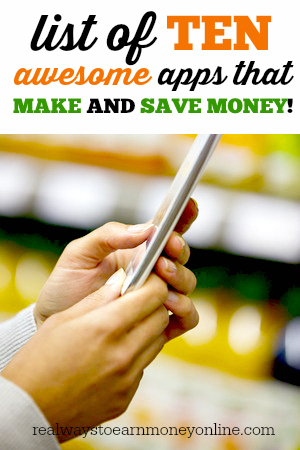 10 Awesome Apps That Make and Save You Money! Published November 3, 2014 By Anna T. This post may contain affiliate links. Regardless, I only recommend sites I've researched and/or used and trust. I am very excited about today's post! If you've been following me for long, you know that I like to occasionally do reviews of smartphone apps that pay you. Well, today we will be talking about smartphone apps that make and save you money. Note that this isn't just a collection of some apps that pay and some apps that save — all of these apps are unique because they let you do both! Some of the apps below I've reviewed here before, and some I have not. Before we get into the list, I want to say that I recommend using as many of these apps as you can to maximize your savings and earnings. You would be amazed at how lucrative these all are and what a difference they'll make for you if you actually use them. I've done some pretty extensive research into this topic and I feel confident in saying that, of these types of apps, the ones listed below are the best of the best. Enjoy! Ibotta is available for iPhone or Android, US only. Once you have the app installed, you can browse their current offers to see what you can earn cash back on. They have lots of grocery items, and you can also earn cash back on some restaurant purchases, going to the theater, etc. What they have changes regularly. If you see something you know you're going to purchase, just redeem it and then follow the instructions. You'll have to answer a short poll, trivia, or watch a video before the item can be available for redemption. After you've purchased the item, simply upload your receipt and your cash back for that item will go into your Ibotta account. Ibotta also has some stores where, if you have a loyalty card, there is no need to upload a receipt. You can just link your loyalty card number for that store to your Ibotta account and it will recognize when you've bought the item and you'll get your cash back. You need at least $10 to redeem your earnings, and they will be sent almost instantly to either Paypal or Venmo. They also allow you to redeem for various gift cards. You can also earn $5 for each friend you refer to Ibotta, but you won't get the $5 until they redeem their first offer. Read the full Ibotta review or here to sign up for Ibotta. Checkout 51 is available for both iPhone and Android, US or Canada. This one is very similar to Ibotta because you can earn cash back for buying certain grocery products. Their offers change each week, and it's most always very popular things you might buy anyway, so it can add up. If you do not have a smartphone, you can also opt to use Checkout 51 online. That is one feature that sets it apart from Ibotta — the fact that it doesn't have to be used as an app. Checkout 51 can also be used at any store. To use Checkout 51, just browse the available offers, select the ones you know you're going to buy, then upload your receipt to prove you've bought them. Once Checkout 51 has confirmed your purchases, they will credit your account with the cash back. You can then request a check once you've earned at least $20. Checkout 51 does not currently have a referral program. Read the full Checkout 51 review or go here to sign up. The Saving Star app is available for iPhone or Android, US only. You can also use Saving Star on the web, so it's possible to take advantage of the savings/earnings even if you don't have a smartphone. Saving Star is similar to Checkout 51 and Ibotta (above) because you can browse through their grocery offers, select things you know you're going to buy, and then get cash back paid to you once Saving Star confirms your purchases. Saving Star does not require that you upload receipts for confirmation. You just link your grocery store loyalty cards to Saving Star and you'll get your cash back automatically if you've purchased the items you selected. Saving Star will pay you once you have $5 in your account. You can request a direct bank deposit, Paypal cash, Amazon code, or you can opt to donate your earnings to a charity. Saving Star does not currently have a referral program. Read the full Saving Star review or go here to sign up. The Groupon Snap App is available for iPhone or Android, or it can be used online. You can use Snap as long as you live in the US or Canada. This is another “cash back for groceries” app. Just browse the offers at Snap and select the ones you know you're going to purchase. After you've made your purchases, upload your receipt to Snap within two days and they will credit your account with the cash back amount for their grocery offers that you purchased. Unlike Ibotta and Saving Star, you can use Snap at absolutely any store. Once you've earned $20, you can request a check to be mailed to you. Snap does currently have a referral program as well. You can earn $1 for every friend you invite to Snap through your unique link and redeems their first eligible offer. Go here to sign up and start using Snap or go here to read the Snap review. Shopmium is available for iPhone or Android users, US or France only. It works just like Ibotta and Checkout 51. Browse their grocery offers (they change weekly), select the ones you're going to buy, and then take a photo of your receipt and upload it via the Shopmium app. You can choose to be paid via either Paypal or directly to your bank account once your cash back offers have been approved. There is no minimum for cashing out and no “cash out” button to remember to push. Once your offers are approved, Shopmium just sends the payment. There is a referral program at Shopmium as well. They'll give you $2 for every friend you refer after they redeem their first offer through Shopmium. Go here to learn more about Shopmium. Update 7/17/18 – While Shopmium still exists, it is no longer a US based program. The Walmart Savings Catcher app is available to iPhone and Android users, US and Puerto Rico only. The way this one works is very simple. Download the app and then go shop at Walmart. After you've paid and gotten your receipt, enter your receipt number into the app and it will do price matching for you, checking the prices of local competitors. If there are any retailers offering a lower price on anything you paid for, Walmart will give you the difference via an e-gift card you can use to shop at Walmart (you can use the card either online or in-store). It doesn't look like there is any referral program for Savings Catcher. Receipt Hog is available to iPhone or Android users. To use Receipt Hog, just take pictures of all your receipts and upload them. You can upload receipts from any store regardless of what you bought. Receipt Hog will then reward you with “coins” you can redeem for cash to Paypal or an Amazon gift card. You only need 1000 coins to redeem for $5. The coin value for each receipt depends on how much you spent — the more you spend, the more coins you get. Go here to learn more about Receipt Hog. The ReceiptPal app is available for iPhone or Android. To earn with this app, you simply take pictures of your receipts and then get rewards. You can use lots of receipts, not just ones from the grocery store. Currently ReceiptPal only pays out in points you can use towards gift cards or sweepstakes entries. Go here to get started with ReceiptPal. This app is available for both iPhone and Android users. You can earn “kickbucks” with Shopkick by checking in at stores, scanning barcodes of products in those stores, and of course taking advantage of their exclusive deals and offers. This app is known for offering a fairly generous amount of “bucks” for the things you do. You can use your bucks to redeem for gift cards and vouchers to popular retailers. This app is available for both iPhone and Android users. Just use it when you go shopping and see what offers you can get cash back on. Buy those offers from any store, take a pic of your itemized receipt, and then get paid with Paypal that same day (no minimums). Go here to read the review of MobiSave or here to get started. Update 7/17/18 – MobiSave is now FetchRewards. And that wraps up our list! I said it above, but I'll say it again — don't limit yourself to just a few of these apps! They aren't connected to each other in any way, so you can use all of them. By using all or most of these, you will greatly increase the amount of money you can earn/save. Do you use any other apps that help you make and save money? Please share in the comments below! Just wanted to say I live in a small town I tried both shopkick and jingit in the past and the amount of work put in didn’t seem worth it for what little there was here but a lot of these sound like they could be useful and the Walmart and receipt apps sound amazing and totally worth the time! Thanks! I would think so, as long as the item still shows up within the app as something you can get credit for, and you have a receipt. I was looking into the apps available in Canada and they have horrible ratings from users of said apps. For instance it appears that a recent update for Checkout 51 has a lot of people upset and it’s current score is 4.0. The same sort of review on Snap by Groupon it has a 3.8 rating after their latest update. I used Flipp but would love to see coupon apps that provide more deals on food rather than cleaning or personal hygiene products. I normally love when you review smartphone apps, but this one may need to be reviewed based on how the apps are currently performing. You forgot to include Receipt Pal. You can upload ANY receipt and earn 25 points per receipt. Redeem for gift cards or PayPal. Saving Catcher is great – thanks for recommending that one! Never throw away your receipts! There are many apps JUST like Ibotta (Referral Code: nsaejtk). You shop grocery, scan the receipt and make cash / gift cards! You can always use multiple apps to get the most bang for your buck. In exchange for the new info, I would appreciate that if you would use my referral codes!!! – Take a pic of receipts from any grocers, pet, drug, and/or beauty supply, and earn coins that can be converted to Amazon gift cards or PayPal cash! As a bonus, every start of the week earns a spin on their prize wheel for extra coins (when you upload your first receipt of the week)! – You get 5 free spins for using my code!!! – Just like Receipt Hog, but you can pretty much scan any receipts including e-receipts! – Similar to Ibotta, Jingit and Shopmium, but on top of that, you get freebies such as Hershey’s Trident chewing gum and etc… every Fridays! Just started using the Walmart Savings Catcher app, and I love it! They do all the work for you, then give you the money back! A little here, and a little there can really make a garden grow. But boy that seems like a lot of work to remember/manage. Still, this is a very helpful post for those who are into these things. Thanks for sharing.